Mary is also a painter and painting instructor trained by Susan Sarback in California. Her artwork resides in various collections around the world. Find out more about Mary’s painting. The endeavor of writing can be long and lonely. Mary Carroll Moore, master writing instructor, to the rescue! Moore packs How to Plan, Write, and Develop a Book with years of gritty good sense and big-picture perspective. Her techniques for drafting, organizing, and polishing a book are practical and time-tested. Here is a first-time book-writer’s best companion. Book signing for Qualities of Light, October 2009. Mary Carroll Moore, M.A., MFAW, has been writing, teaching, and publishing since the 1970s. Her twelve published books include the novel Qualities of Light (Spinsters Ink, 2009), the memoir/self-help book How to Master Change in Your Life: Sixty-seven Ways to Handle Life’s Toughest Moments (Eckankar Publications, 1999), and eight titles in the health and food genres including Cholesterol Cures (Rodale Press) and the IACP/Seagrams (Julia Child Award) winning Healthy Cooking (Ortho Publications). Her forthcoming book on the craft of writing, Your Book Starts Here: Create, Craft, and Sell Your First Novel, Memoir, or Nonfiction Book, based on her "How to Plan, Write, and Develop a Book" writing workshops, will be released in December 2010 by Riverbed Press. Mary's work has been featured in the New York Times, USA Today, and on WNPR. Read about Mary in The New York Times. She teaches workshops and weekly writing classes both online and in person at writing schools around the U.S., including the Loft Literary Center in Minneapolis, The Hudson Valley Writers’ Center near New York City, Madeline Island School for the Arts on Madeline Island in Lake Superior, the New Hampshire Writers' Project in Manchester, Grub Street Writing School in Boston, and other locations. Find out more about Mary's teaching. 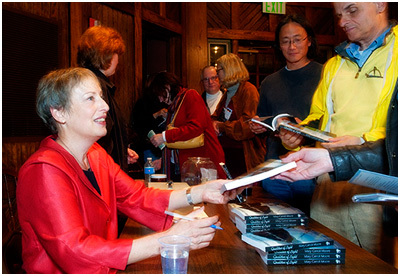 A former nationally syndicated columnist for the Los Angeles Times, Mary’s essays, short stories, articles, and poetry have appeared in literary journals, magazines, and newspapers around the U.S. and have won awards with the McKnight Awards for Creative Prose, Glimmer Train Press, the Loft Mentor Series, and other writing competitions. She lives with her family in Connecticut and New Hampshire and writes a weekly blog for book writers.